One of the core visions of Croydon Tabernacle is for it to be a place where people of all races, culture and gender find love, hope and fulfilment in Christ Jesus and attain their God ordained destiny. 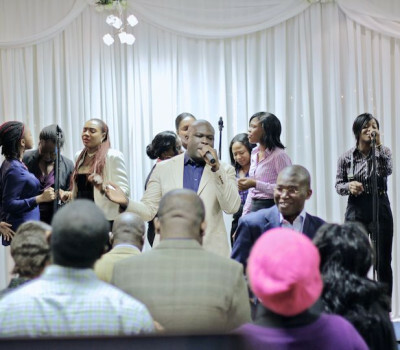 Croydon Tabernacle has a great focus on prayer and worship, seeking the truth that is in the Word of God. The church began in the month of November 1996 as an outreach mission of Jesus House, the Redeemed Christian Church of God. It had a predominantly Nigerian membership and has evolved to include members across the Ghanaian and Ugandan communities. It began with a group of 7 adults to presently a church of 250 adults and approximately 150 children. Its operations have moved along these lines and have developed organically to support the church. In June-July 1998, the church moved from Fairfield Halls and took over Faith Growth Ministries based at 38/40 Parsons Mead – our current premises in West Croydon. The following year, the 3-story building was bought and has become the permanent base and place of worship. where people of all races and gender, find love, hope, fulfilment and attain their God ordained destiny. of prayer and worship, seeking the truth that is in the Word of God. where every member is a warrior of the Almighty God. where God’s people are trained and equipped for the work of the Kingdom. where called businessmen are taught how to apply Christian principles in business and the workplace. where the total person is ministered to. where God’s people are facilitated to obtain spiritual insight, focus and divine direction for their lives. where God given talents and gifts amongst all members are discovered and developed. where the lost, the hungry, the oppressed and the disadvantaged in the community are reached out to. Our vision which is line with the RCCG Mandate drives our desire for church planting. Over the years; we have planted different parishes in and around Greater London and has recently planted two new churches targeted to cut across diverse cultures and people – The Gateway Church.